Giriraj Singh and other BJP leaders have been accused of links to Manorama Devi, whose Bhagalpur-based NGO Srijan has been accused of embezzling government funds. 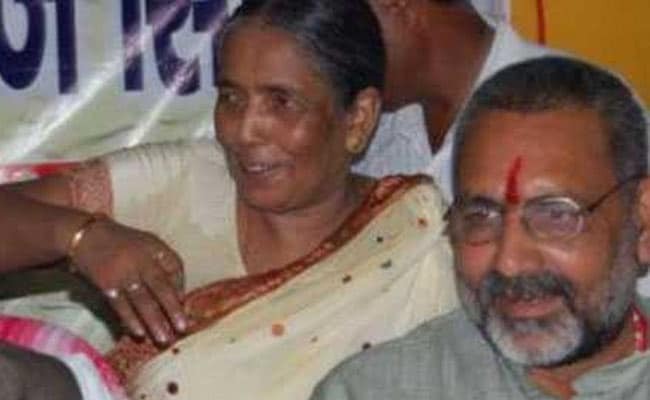 Bhagalpur NGO scam: Giriraj Singh has been seen several photographs with Manorama Devi. Patna: In the crosshairs of political opponents over several photographs that paint him close to the main accused in a multi-crore scam in Bihar, Union Minister Giriraj Singh seems to be in the mood to take on his critics. "If anybody has the guts, I dare them to prove that I benefitted from the accused. I am ready to face any punishment if they prove it," he told NDTV, raising a vehement defence. Asked about pictures that show him attending even private events organised by Manorama Devi, the founder of the non-profit at the centre of the corruption scandal, the minister said that mere photographs don't imply guilt; "Especially for people who are active in public life," he added. On the defence over the corruption scandal that has been gnawing at the newly-minted alliance between his party Janata Dal (United) and the BJP, Chief Minister Nitish Kumar has recommended a CBI inquiry into the case. Asked about whether he expected to be called in for questioning, Mr Singh said, "The CBI should have a basis to call people for questioning. I don't think they will call me based just on photographs of me attending certain events." The Union Minister's comments came as Nitsh Kumar's friend-turned-foe RJD president Lalu Yadav on Sunday demanded the resignation of the Chief Minister and his deputy Sushil Kumar Modi, saying the state government had not taken any action in the case. Mr Yadav has alleged that not just minister Giriraj Singh but Shahnawaz Hussain, and several other BJP leaders had links with Manorama Devi, who died last year. He says that between 2005 and 2010 - when Mr Kumar ruled the state in a partnership with the BJP - government money was allegedly embezzled with the help of Manorama Devi's NGO called Srijan. Investigators have said the scandal could be worth at least Rs 700 crore. Eighteen people including three government bank officials and an assistant to the District Magistrate of Bhagalpur have been arrested in the case. One of the accused, Mahesh Mandal, who was suffering from cancer and kidney problem, died late last evening.